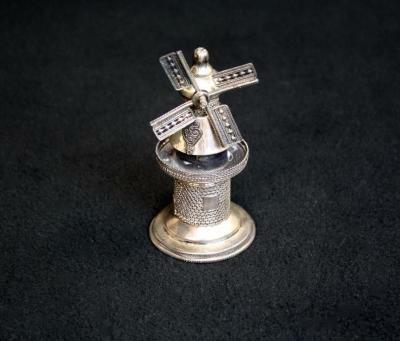 Spice box in modern windmill motif on closed, heavily filigreed base created by Ben-Zion, an Israeli Artist. The Havdalah service marks the end of Shabbat, on Saturdaynight. Three things are necessary for this ritual: a glass of wine or other liquid, fragrant spaces and a special Havdalah candle. The second blessing is recited over fragrant spices; these represent a compensation for the loss of the special sabbath spirit. These spices are commonly kept in a special decorated box called a b'samim box.